There are few things I like more than spotting this sort of sign outside an eatery. I was strolling down the Northcote Road with my friend K this weekend, when we came across Samba Swirl. Somewhat surprisingly, I had never heard of this London chain before (they also have branches in Islington, Chiswick and Camden Town) and would have barely glanced had I not been confronted with the GF sign. We ummed and ahhed as we had only just eaten brunch (at the food-lovers heaven that is the Clapham Junction Wholefoods Cafe), but decided that these crepes deserved a taste test. The only other place in London/The World that I have found serving gluten-free crepes has been Senzala Creperie in Brixton Village (highly recommended! ), so it is not exaggerating to say that there was an element of novelty here for me. There were lots of funky toppings available, but in the end we settled with the classic nutella, which went perfectly with the cinnamon-flavoured pancake. I chatted to the lady in the cafe and she said that there should be no cross-contamination issue because ALL the pancakes they make are gluten-free. This was music to my little coeliac ears! She was not sure whether all of the toppings were gluten-free (some definitely looked cereal-based so I think possibly not) but there were things like fruit, flaked almonds, jam, whipped cream, etc which should be OK. So what did we think? K and I both thoroughly enjoyed our hot crepes, encased in the crepe-cone for a sweet on-the-go snack. My only complaint would be that the little plastic spoon supplied for eating with was a bit piddly and ineffective – I threw dignity to the wind and ate mine like a sandwich. P.S. They seem to be re-branding so the website is a bit pants at the moment, but if you click past the notice you can have a peek at their menus. 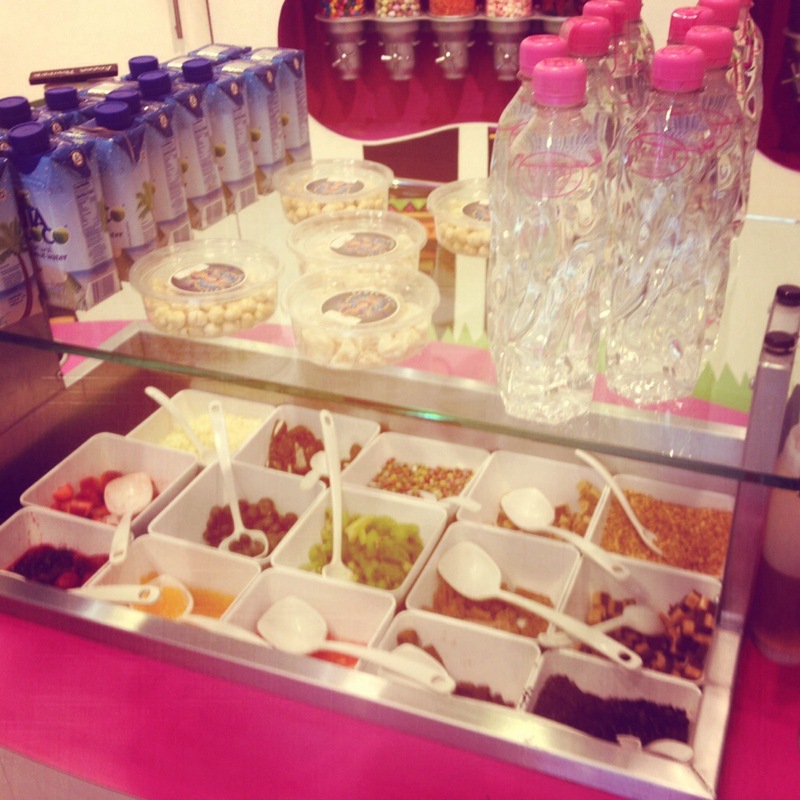 They also do frozen yoghurt which will be very welcome when the weather heats up. 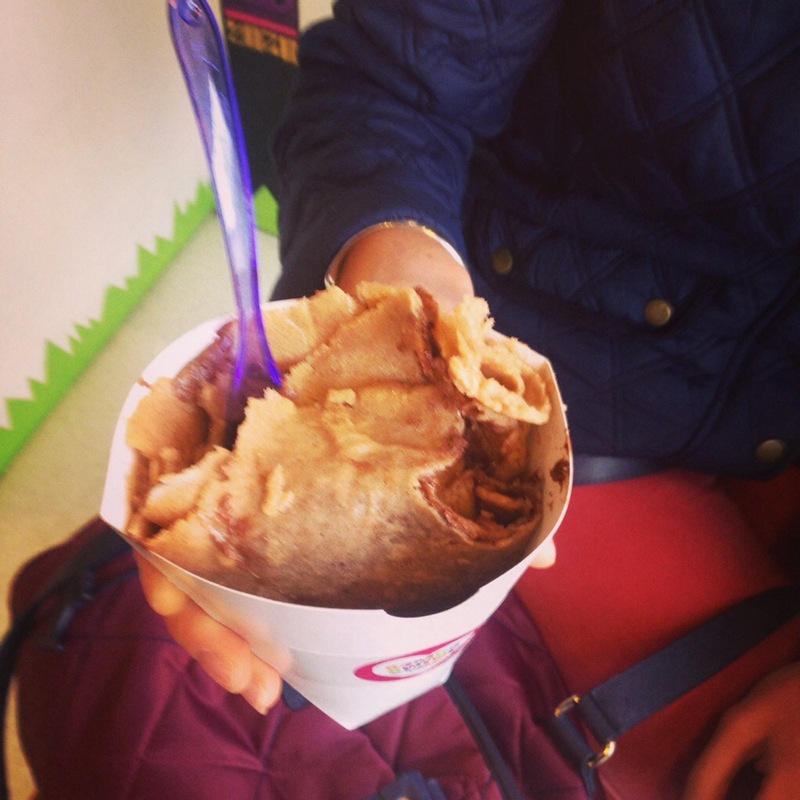 i used to live down the road from Samba swirl before they did crepe, the froyo was a delight! 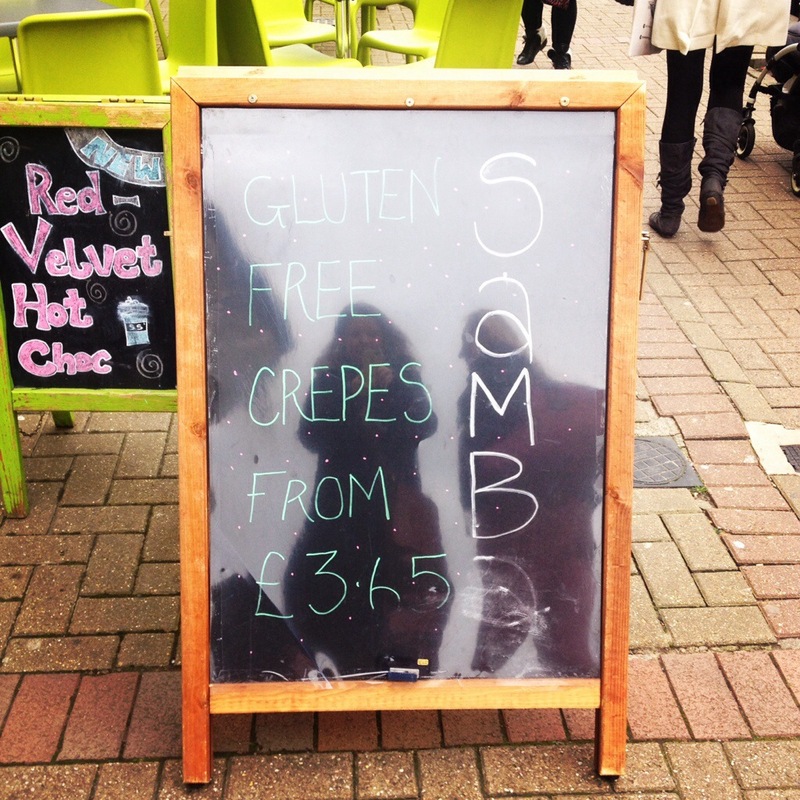 FYI they make gluten free crepes at St Katherines Dock Food Market (Fridays) in Wapping and also at Brick Lane Market (Sundays), both are outdoor stalls, and use separate stove-tops to cook them to avoid cross-contamination.